Aidan O'Rourke is a fiddler, composer, producer and one of the most influential folk musicians of his generation. 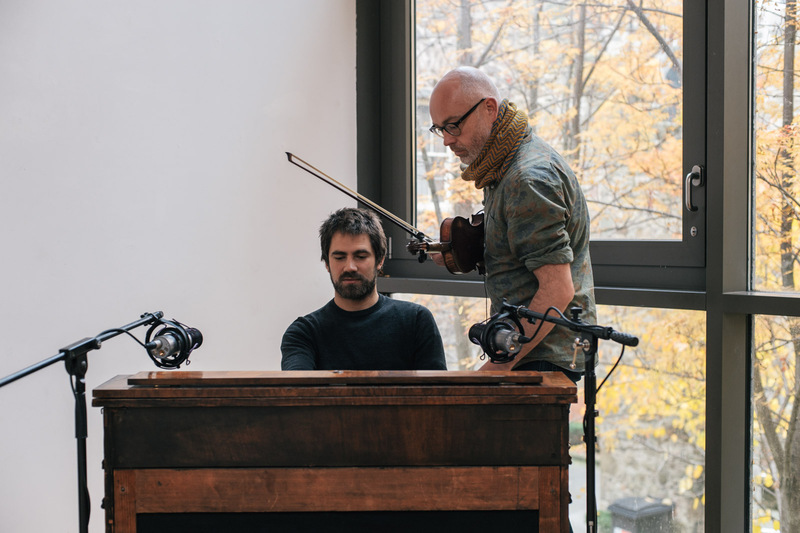 With his trio Lau (singer/guitarist Kris Drever, accordionist Martin Green) and various solo and collaborative projects, he has pioneered a new sound in Scottish folk and re-contextualised traditional forms with experimental, improvised, jazz, classical and electronic music. Kit Downes is a BBC Jazz Award winning, Mercury Music Award nominated, solo recording artist for ECM Records. He has toured the world with artists such as Squarepusher, Thomas Strønen and Django Bates and written commissions for Cheltenham Music Festival, London Contemporary Orchestra, Stavanger Konserthus, Cologne Philharmonie, BBC Radio 3 and the Wellcome Trust. 365 project all began with the book of short stories by the same name by Scottish author James Robertson. James is one of Aidan's favourite authors and this is a musical response to his short stories that he wrote every day for a year in exactly 365 words. Aidan wrote a musical piece for each story alongside Kit and has released Volume 1 on CD with Volume 2 due to be released in 2019. There is no doubt the tunes are based in Scottish folk music but like his music he has created with LAU he is always interested in new ways of playing with old forms. This exciting new collaboration with Piano / Harmonium player Kit Downes has brought it all together with jazz overtones and the church organ repertoire he grew up playing. In the summer of 2019 Aidan plans to build a touring installation that will present all of the tunes, stories and audio recordings together, due to be launched at Edinburgh Book Festival in August 2019.